The impropriety is that RWJF is closely tied to Johnson & Johnson Company, which manufactures or owns Nicoderm, Nicotrol, Nicorette, Commit (pharmaceutical nicotine products) as one of J & J's largest shareholders (the only stock that RWJF owns incidentally) and the fact that RWJF board members are former J & J executives and / or J & J board members; RWJF's push to ban tobacco nicotine use, appears to be profit and market driven. As a matter of fact, Blue Cross Blue Shield of MN reported that the use of pharmaceutical nicotine products aforementioned tripled after implementation of said smoking bans. Clearly, it is time to reverse the smoking bans imposed on privately owned bars & restaurants and/or force RWJF /J & J to compensate those of us in the hospitality and hospitality support industries. 1. Fiber McGee's: 47528 Pontiac Trail, Wixom. Established around 1984. 2. Players Billiards Bar & Grill: 38503 W 10 Mile Rd, Farmington Hills. Established 1991. 3. O'Tooles: 24555 Novi Road, Novi. One of four successful locations: three remain open. 4. Deer Lake Inn: 7504 Dixie Hwy, Independence Twp. Est. 1918 as a stagecoach stop. 6. Fletcher's City Saloon: 416 Main Street, Cement City. Established around 1931. 7. TC's Bar and Grill: 10010 E Pickard Rd, Mount Pleasant. Established 2009. 8. Crazy Parrot Pub & Grub 9205 Pelham, Allen Park. Established around 2006. 9. Grand Blanc Inn: 5313 S Dort Highway, Flint. Est. prior to 1979: looking for info. 10. Wild Cherry Lounge 15224 East 8 Mile, Detroit. Established around 1991. 11. Julian’s II - 2053 Division Ave. SE, Grand Rapids. Established around 2004. 12. Whiskey Pete's: 1925 24th Street, Port Hurton. Established around 2002. 14. Jackalope’s Country Bar, 3530 Biddle Avenue, Wyandotte. Established 2009. 16. Oak Room Grille: 7200 River Road, Cottrellville. Established around 2005. 17. Cousin's Bar: 113 S Port Crescent St, Bad Axe. Established 1989. 18. Club Carbon / The Blue Note: 760 W Broadway Ave, Norton Shores. 19. Tally Ho: 7933 Lakeshore Road, Burchville. Established 2009. 20. Westside Bar: 1568 Broadway Ave NW, Grand Rapids. Established 1996. 22. Bar Star Lounge: 12950 Northline Rd, Southgate. Established 2008. 23. The Treehouse Bar & Grill: 12213 Telegraph, Taylor. Established 2006. 24. Four Green Fields: 30919 Woodward, Royal Oak. Est. 1980: closed after 31 years. 25. Ted's Firehouse Pub & Grill: 809 Greenwood Ave, Jackson. Established 1996. 26. The Wayne Road Pub: 1870 S Wayne Road, Westland. Established 2001. 27. Wheat and Rye Westland: 7291 N Middlebelt Road, Westland. Established 1993. 28. Pick-a-Bone Saloon/West on 6: 30325 Six Mile, Livonia. Established 1995. 29. Scotty's Lounge: 5630 Martin Road, Muskegon. Established 2006. 31. Blue Moon Saloon: 7296 Main Street, Owendale. Established 1992. 32. Jerry's Diamond Restaurant & Lounge: 122 Oak St, Wyandotte. Established 1987. 33. Muskegon Athletic Club: 333 W. Western, Muskegon. Established 2008. 34. Tommy V's Café & Pizzeria: 310 East Midland, Bay City. Established 1999. 35. O'Hares Bar & Grill: 608 E. Midland Street, Bay City. Established 2003. 36. Midland St. Pub: 610 E. Midland Street, Bay City. Established 2003. 37. Coach's Bar & Grill: 16015 Ida West Rd, Petersburg. 38. 1999 Tavern: 447 Forest Ave, Plymouth. Established 2005. 39. Pepper Bottoms Warren: 7231 Chicago, Warren. 40. Brewhaus Inn. 3128 Orchard Lake Road, Keego Harbor. Established 1986. 41. Roosevelt's Bar & Grill: 27843 Orchard Lake Rd, Farmington Hills. Established 1992. 42. Roosevelt's Bar & Grill: 44935 Hayes Rd, Sterling Heights. 43. Coach's Olympia Grill: 1067 S Cass Lake Road, Waterford. Established 2005. 44. Barley House Tavern: 113 E Maumee Street, Adrian. Established 1998. 45. Tailgaters: 3075 28TH Street SW, Grandville, MI. Established 2007. 46. Comstock Inn: 6250 North Comstock Ave, Hesperia. Established 2000. 47. Hometown Tavern/The Pump Room: 666 Main Street, Walkerville. Established 2000. 48. Flip's Greenleaf Bar & Grill: 1340 S. Carpenter Avenue, Iron Mountain. Est. in 1950’s. 49. Gering's Bar & Lounge: 20085 Goddard Road, Taylor. Established 1992. 51. Richards Tavern: 550 N Perry Street, Pontiac. Established around 1988. 52. Beaubien Street Saloon: 641 Beaubien Street, Detroit. Open since at least 1994. 53. Damon’s Grill Grand Blanc: 5494 S. Dort Highway, Grand Blanc. Opened in 1995. 56. Outboard Inn: 223 Main Street, Nashville. Established1992. 57. Bistro Bar & Grill: 4735 Washtenaw Ave, Ann Arbor. Established 2003. 58. Quatro's Restaurant: 1295 Stewart Rd, Monroe. Est. 1975 (Rembrandt's). Closed after 36 years. 59. Willy's Lounge: 3475 North Monroe Street, Monroe. Established 1998. 60. Steve's Tavern: 78 West Front Street, Monroe. Operating since at least 1994. 61. Doc's Place / Whistlestop Bar: 201 W Front Street, Monroe. Established 2004. 62. New Hawthorne Valley Country Club: 7300 N Merriman, Westland. Est. 1981. 64. Garfield Inn: 8544 Lake Street, Port Austin. Est. 2003. 65. Grand Rapids Brewing Co.: 3689 28th Street SE, Grand Rapids. Established 1993. 66. Westside Lounge: 1000 W Lincoln Ave Ionia. Established 2004. 67. 3rd Time Around Bar: 2997 Fort St, Wyandotte. 68. Snooker's Pool & Pub: 15431 Dix-Toledo Road, Southgate. 70. Sidetrack Bar & Grill: 1590 56th, Fennville. Est. 2002. 71. Par 5 Grill: 3666 S. Scenic Drive, Shelby. Est. 1997. 73. Francel's Lounge: 11233 Morang, Detroit. Est. 1984. 74. Dawg House: 35965 Groesbeck Highway, Clinton Twp. 75. Charlie's Food & Spirits 2075 Fort Street, Wyandotte. Est. 1980. Closed after 31 years. 76. A.A. Timberlanes: 517 N 2nd, Niles. Established 1985. 77. Abner's: 2865 I 75, Sault Sainte Marie. Established 1981. 78. Alias Bar & Grill: W5504 First, Hermansville. Established 2009. 79. Alleyways Bar & Grill: 2675 Henry Street, Muskegon. Established 2009. 80. Blitz: 6525 23 Mile Rd , Shelby Township. Est. 2009. 81. Bourbon Street Tavern: 4225 South Saginaw Street, Burton. Est. 2004. 82. Bulldog's Bar & Grill: 3002 S Graham Road, Saginaw. Est. 2004. 83. Cal's Corral: 1282 US Highway 2/41, Bark River. Est. 2002. 84. Capo Lounge: 11625 Joseph Campau, Hamtramck. Est. 2004. 85. Casino Bar: 320 W Division Street, Ishpeming. Est. 2000. 86. Clemente's Bar: 2208 Fort Street, Lincoln Park. Established 1955. Closed after 56 years. 87. Cadillac Lounge/Coach Lounge: 1704 Veterans Memorial Pkwy, Saginaw. 88. Cobblestone Bar & Grill: 7481 County Road 415, Mc Millan. Est. 1995. 89. Corner Bar: 14398 M35, Rock, MI. Est. 2001. 90. Demsey's Restaurant: 4497 North Adrian Highway, Adrian. 91. El Vaquero Bar: 10315 W Jefferson, River Rouge. Est. 2007. 92. Elope Lounge: 40813 Garfield Road, Clinton Twp. Est. 2009. 93. Embers Grille: 26125 E Huron River Drive, Flat Rock. Est. 2003. 94. AFB - Another Friendly Bar & Grill: 2500 Park Ave, Detroit. Est. 2004. 95. Fat Boyz Bar & Grill: 811 Delta, Gladstone. 96. Fiero Lanes: 645 Opdyke, Auburn Hills. Est. 1985. 97. Flair: 42050 Grand River, Novi. 98. Fountain View Lanes: 34244 Groesbeck Hwy, Clinton Twp. Est. 1977. Closed after 34 years. 99. Fox Club: 16 West Front St, Monroe. Est. 1988. 100. Frank & Jim's Restaurant: 6598 Michigan 80, Kinross. Est. 2010. 101. Frank's Tavern: 14331 Eastview Drive, Fenton. Est. 1983. 102. Lindell AC Waterford: 3150 Elizabeth Lake, Waterford. 103. The Grapevine: 43155 Market Street, Novi. Est. 2008. 104. Garver Lake Bar: 25020 May Street, Edwardsburg. Est. 1993. 105. George & Harry's Blues Cafe: 22048 Michigan Avenue, Dearborn. Est. 2000. 106. Good Times Bar & Grill: 545 Michigan Ave E, Battle Creek. Est. 1996. 107. Grande Pub & Grill: 3025 W Blanchard, Winn. Est. 2003. 108. Green Dot Stables: 2200 W Lafayette Blvd, Detroit. Est. 1981, closed after 30 years. 109. Ground Round Grill & Bar: 3939 Stadium, Kalamazoo. Est. 1986, closed after 25 years. 110. Hollister'z Nightclub and Café: 210 Huron Avenue, Port Huron. Est. 2009. 111. Hometown Tavern: 161 West Harrison Road, Walkerville. Est. 2000. 112. Hunters Supper Club: 19350 Livernois Avenue, Detroit. Est. 2003. 113. J & N Steakhouse: 200 W Michigan, Ypsilanti. Est. 2007. 114. Jacob's Place: 8540 Michigan, Detroit. Est. 2008. 115. Jammers: 707 W Huron, Omer. Est. 2008. 116. Jan's Eastside Tavern: 2017 Davison Road, Flint. Est. 1995. 117. Jarvi's Bar: 5009 S Old US 45, Paulding. Est 1999. 118. JC's Bar: 1015 Delta Avenue, Gladstone. Est. 2001. 119. JD Billiards: 4045 E Apple Ave, Muskegon. 120. Carino's Italian, 35613 Warren Road, Westland. 121. Jojo's Americana Supper Club: 107 Blue Star Hwy., Douglas. Est. 2006. 122. Shooters Saloon/Kaptains Korner: 20985 27 1/2 Mile Rd, Albion. Est. 1993. 123. Kristopher's: 101 E Center Street, Ithaca. Est. 1988. 124. L.A. Café: 6535 First, Lake Ann. Est. 2006. 125. La Tejana Bar: 1411 Junction St, Detroit. 126. Lakeside Inn: 11303 Chicago Road, Jerome. Est. 1990. 127. Le Naro Pub: 104 Main Street, Lake Leelanau. Est. 1996. 129. Hub's Inn: 1645 Leonard Street Northwest, Grand Rapids. Est. 2008. 130. Delray Cafe: 8032 W Jefferson, Detroit. Closed after 40 years. 131. Sports Page: 225 Michigan Ave W, Battle Creek. Est. 2005. 132. Joe Martini's: 1404 28th Street SE, Grand Rapids. Est. 2008. 133. Trenton Lanes: 3360 W Jefferson Ave, Trenton. Est. 1974. Closed after 37 years. 134. Last Chance Bar & Grill: 27758 W Warren Road, Westland. Est. 2001. 135. Leroy's U.S. Star Bar: 3415 Michigan Ave, Detroit. Est. 1986. 136. Liberati Restaurant & Lounge: 6451 Miller Road, Dearborn. Est. 1986. 137. Lincoln Bar: 6110 W Fort, Detroit. Est. 1986. 138. Little Dublin: 5855 Monroe Blvd, Taylor. Est. 2001. 139. Locker Room Sports Pub: 417 S Michigan, Saginaw. Est. 2008. 140. Lumberjack Grill: 101 Main Street, East Jordan. Est. 1996. 141. Mama Mia's: 1403 S Commerce, Wolverine Lake. 142. Mama Mia's on Main/Pub & Grub: 1213 Ludington, Escanaba. 143. Grissom's Pub (Mar-Dee's Place): 27626 Harper Ave, Saint Clair Shores. Est. 2001. 144. Marsooz Pub (Driftwood Saloon): 217 E Front Street, Buchanan. Est. 1981. 145. Marwood Inn: 6062 River Road, East China Twp. Est. 2008. 146. The Minnie Tucker Grill: 68400 Klinger Lake Road, Sturgis. Est. 1994. 147. Modern Food & Spirits: 1535 Cass Lake Road, Keego Harbor. Est. 2006. 148. Montana's: 34290 Ford Road, Westland. Est. 1989. 149. The Moose Pub: 2552 S. I-75 Business Loop, Grayling . Est. 2004. 150. Breakers On The Bay: 1404 Port Austin Road, Port Austin. 151. Time Out Bar and Grill: 2804 E Michigan Ave, Jackson. 152. Z Bar & Grill (was Nik's then MVP): 31222 Ecorse Road, Romulus. Nik's Est. 1992. 153. North Lake Inn: 54046 County Road 384, Grand Junction. 154. North Point Seafood & Steakhouse: 8031 Main Street, Dexter. Est. 2006. 155. Northwoods Candlelight Inn: 18334 State Hwy. M38 Ontonagon. Est. 2007. 156. Old Fisherman's Pub: 5235 Portage Road, Portage. Est. 2005. 157: O'Tooles: 6104 Miller, Swartz Creek. Est. 2001. 158: Papa's Three Star Bar: 12407 E Eight Mile, Warren. Est. 1983. 159: Penalty Box Sports Saloon: 80874 Memphis Ridge Road, Memphis. Est. 2000. 161: Pierson Village Inn: 10 4th Street, Pierson. Est. 2006. 162. Pigeon Lake Lodge: 7175 Lakeshore Drive, West Olive. Est. 2006. 163. Pomorski's Tavern: 1302 S Madison Street, Ludington. Est. 2007. 164. Port 412: 412 State Street, St Joseph. Est. 2006. 165. Posen Pub: 10866 Michigan, Posen. Est. 2002. 166. Post Bar Ferndale: 22828 Woodward Avenue, Ferndale. Established 1998. 167. Black River Valley Pub & Grub: N11582 Black River Road, Bessemer. Est. 1992. 168. Rio Grande Steakhouse: 1820 44th Street SW, Wyoming. Est. 1998. 170. Rube's Bar & Grill: 1117 North Chevrolet Ave., Flint. Est. 2002. 171. Rustic Inn: 3163 N Red Oak Road, Lewiston. Est. 1989. 172. Villa Restaurant: 393 Nepessing, Lapeer. Est. 1986. 174. Corner Bar & Grill: 1030 East Vine Street, Kalamazoo. Est. 1976, closed after 35 years. 175. Savoy (Club Divine): 23 N Washington Street, Ypsilanti. Est. 2003. 176. Pub 13: 13 N Washington Street, Ypsilanti. 178. Sauk Trail Bar & Grille: 15463 US Highway 12, Union. Est. 2005. 179. Sayfee's East: 3555 SE Lake Eastbrook, Grand Rapids. Est. 1948. 180. Saylors Bar & Grill: 377 South Blvd E, Pontiac. 181. Senor Franks: 2675 Dixie Hwy., Waterford. 182. Shield's of Rochester Hills: 1488 Rochester Road, Rochester Hills. 183. Shield's of Warren: 5702 E 12 Mile Road, Warren. 184. Shot's Tavern: 30859 W 10 Mile Road, Farmington Hills. Est. 1988. 185. Eagle's Nest Bar & Grill, 1200 Eagle Point, Clark Lake. Closed June 2011 after 50 years in business. 186. Silver Tap: 659 20th Street North, Springfield. 187. Small Planet/Arena: 16800 Chandler Road, East Lansing. Est. 2008. 188. Sparta Pub: 270 S State Street, Sparta. Est. 2008. 189. Dee's Sportsmen's Bar: 2926 Peck Street, Muskegon. Est. 2001. 190. St Joe's St Pub: 126 West Saint Joe Street, Litchfield. Est. 2002. 191. Steak & Tavern: 27590 Orchard Lake Road, Farmington Hills. 192. Sterling Sports Pub: 37722 Van Dyke Ave, Sterling Heights. Est. 1997. 193. Stingers Other Bar: 130 North Matteson Street, Bronson. Est. 2004. 194. Stooges Restaurant: 227 Main Street, Saint Joseph. Est. 1996. 195. Tavern on 13: 17600 W 13 Mile Road, Beverly Hills (a.k.a. Flying Fish). 196. Teddy's Times Square: 45841 Hayes Road, Shelby Township. Est. 2005. 197. Teebone-Z Tavern On the Water: 3482 West Silver Lake Road, Fenton. Est. 2002. 198. Terri's Lounge: 2605 Fenton Road, Flint. Est. 1998. 199. Olympic Lanes / Arena Lounge: 2800 N Milford Road, Highland. Est. 1998. 200. The Belmont Tavern: 10215 Joseph Campau, Hamtramck. Est. 2000. 201. The Catch Island Grill: 120 S Park Street, Traverse City. Est. 2007. 202. The Cherry Martini: 50296 Cherry Hill, Canton. Est. 2006. 203. The Deer Horn Inn: 19327 Caberfae Highway, Wellston. Est. 1980. 204. Billy's Road House: 7491 North Dort Hwy, Mount Morris. Est. 1999. 206: The Bank Nightlife: 77 S Main Street, Mt. Clemens. Est. 2005. 207. The Establishment: 311 W Market Street, Benton Harbor. Est. 1973. 208. The Fondue Room: 82 Macomb Place, Mt. Clemens. Est. 2002. 209. The Limit Cocktail Lounge: 15535 W Eight Mile, Detroit. Est. 2006. 210. The Little Bar: 321 Chartier, Marine City. Closed due to fire, did not reopen. Est. early 1900's. 211. The Friendly Roosevelt Bar: 3424 Caniff, Hamtramck. Est. 2005. 212. Time Out Sports Bar: 57363 N Main, Three Rivers. Est. 2005. 213. Tommy T's Club 59 Bar & Grill: 1302 W Huron Street, Waterford Twp. 214. Tower Tavern: 9235 Michigan 68, Tower. Est. 1999. 215. Tullio's La Riviera: 7910 Allen Road, Allen Park. Est. 2007. 216. Uncle Dave's Bar: 6538 Michigan Ave., Detroit. 217. Under the Eagle: 9000 Joseph Campau, Hamtramck. 218. Wagon Wheel Tavern: 2030 East Nicholson Hill Road, Ossineke. 219. Rock Fire Grille (Wildfire Grill): 1144 E Paris Ave SE, Grand Rapids. Est. 2009. 220. Wine Sync: 122 W Main Street, Northville. Est. 2007. 221. Bob's Place: 7515 S US Highway 31 Alanson. Est 1984. 222. Victory Club: 396 Pettis Avenue SE, Ada. Est. 2008. 223. Wheat & Rye Bar & Grill: 8120 South Telegraph, Dearborn Heights. Est. 1975. 226. Wooden Nickel Saloon: 1382 E Mason Street, Dansville. 227. Alvin's: 5756 Cass Avenue, Detroit. Est. 2007. 228. Doug's Friendly Tavern: 103 North Saginaw Street, St. Charles. Est. 1987. 229. Hanover Main Street Pub: 130 W Main Street, Hanover. Est. 1997. 230. Wonderland Lanes Livonia: 28455 Plymouth Road, Livonia. 231. Ypsi-Arbor Lanes: 2985 Washtenaw, Ypsilanti. Est. 1964. 232. Charlie's Pub & Grub: 2472 W Argyle Road, Argyle. Est. 2002. 233. Stan's Bar & Grill: 3350 Auburn Road, Auburn Hills. Est. 1990. 234. Northern Lites Sports Bar: 373 US 31 South, Traverse City. Est. 1991. 235. The Brighton House: 10180 Grand River, Brighton. Est. 2004. 236. Dog House Lounge: 4186 Davidson, Burton. Est. 1977. 237. Cheers Bar & Grill: 6211 Pointe Tremble Road, Algonac. 238. The Sand Bar: 7479 Dyke, Algonac. Est. 2005. 239. Clifford Bar: 9711 Main Street, Clifford. Est. 1999. 240. Hawkeye's Grill & Pub: 11551 Brooklyn Road, Brooklyn. Est. 2005. 241. Last Call Lounge: 13736 Michigan Ave., Dearborn. 242. Champion's Restaurant: 2030 Black River Street, Deckerville. Est. 2002. 243. Jimmy D's Lounge: 14700 E Seven Mile, Detroit. 244. Boss Life Lounge: 23852 West 7 Mile Road, Detroit. Est. 1996. 245. Lot 1210 Restaurant & Lounge: 1344 Broadway, Detroit. Est. 2007. 246. Fifth Season Italian Restaurant: 8 Center Street, Douglas. Est. 2008. 247. Mulligan's Irish Pub: 214 Newman Street, East Tawas. Est. 2004. 248. O'Malley's Fenton: 3324 Owen Road, Fenton. 249. Mr. John's Food & Spirits: 1750 W Houghton Lake Rd, Lake City. Est. 1985. 250. Frankie's of Garden City: 31268 Ford Road, Garden City. Est. 1990. 251. Garfield's Restaurant Pub: 3200 Airport Road, Traverse City. Est. 2006. 252. Whiskey Lounge: 1044 Godfrey Ave SW, Grand Rapids. 253. Boston's Restaurant & Sports Bar: 2024 Celebration Dr NE, Grand Rapids. Est. 2008. 254. Grant Tavern: 189 South Maple Street, Grant. Est. 2002. 255. Tailwinds Grill & Bar: 800 State Highway M94, Gwinn. Est. 2002. 256. Moose Pub: 2552 Interstate 75 Business Grayling. Est. 2004. 257. Growler's Pub: 408 N James Street, Grayling. Est. 2003. 258. North Shore Grill 'n Pub: 2131 Jasberg Street, Hancock. Est. 2002. 259. Mt. Maria Lodge Bar & Grill: 525 Nemode Street, Spruce. Est. 2000. 260. Hot Rodz Bar & Grill: 28937 Warren Rd, Garden City. 261. Gringo's Grill: 2863 West Shore Drive, Holland. Est. 2008. 262. Platte River Inn: 10921 Main Street, Honor. 263. Randy's Grand Slam: 11522 U.S. 41, Champion. Est. 1988. 264. River City Lanes: 90 E Genesee, Iron River. 265. 44th Street Bistro: 1950 44th St SE, Kentwood. 266. Malamute Saloon: 3047 Michigan 80 Kinross. 267. Frank & Jim's: 6598 W M 80,Kinross. 268: The Surrey House Restaurant and Saloon: 125 E Beech, Harrison. Operated as a hotel & tavern on and off since the 1880's. Most recently established in 1945 as The Colonial House, in 1949 renamed the Surrey House. 269. Jacmar's Lounge: 28775 Dequindre Road, Madison Heights. Est. 1986. 270. Red Arrow Bar: 106 E Saint Joseph Street, Lawrence. Est. 1985. 271. George's Sports Bar: 22 Main Street, L'Anse. Est. 1992. 272. Bear Claw Brewery & Grill: 10559 West Watergate Road, Cadillac. Est. 2008. 273. Lakeview Bowling Center: 9775 N Greenville, Lakeview. Est. 1997. 275. Viking Lanes: 1483 Gratiot, Marysville. Est. 1984. 276. Loon Saloon: 101 E Main Street, Mecosta. Est. 1996. 277. The Public House: 225 W Main, Mendon. Est. 2007. 278. Forza Sports Bar & Grill: 131 S. Milford Road, Milford. 279. White's Street Side Tavern: 111 W State Street, Montrose. 280. Shap's Restaurant: 2520 W Hill, Flint. 281. Twin Creek Inn: 1105 East Old M 63, Luther. 282. Doc's Bar: 305 River Street, Ontonagon. 283. Olive Leaves: 780 S Lapeer Road, Lake Orion. 284. Post Bar East Lansing: 213 Ann, East Lansing. 285. Billie's Bar & Grill: 4758 Territorial, Millburg. 286. Sea Grille: 6199 Orchard Lake Road, West Bloomfield. 287. The Walton's Lodge Bar & Grill: 45660 Mound Road, Shelby Township. 288. Grove's Highland Pizza: 2786 E Highland Road, Highland. 289. Driftwood Lanes: 1958 E Greenwood, Prescott. 290. Lighthouse Lounge: 1125 South Water Street, Bay City. Est. 1998. 291. Watertower Grill: 7245 Lakeshore Road, Lexington. 292. Foster's Pub: 1071 S US Highway 27, Saint Johns. 293. BonFire Grill: 18564 200th Avenue, Tustin. 294. Oak Beach Sports Bar: 6789 Oak Beach Road Port Austin. 295. The Machine Downtown Grill: 105 West Chicago Road Sturgis. 296. Elite Bar: 365 North Main Street, Watervliet. 297. Pine Bluff Restaurant & Lounge: 10140 CR 135, McMillan. 298. Wayne Road Pub: 1870 South Wayne Road, Westland. 299. Wooden Shoe Bar: 247 E M61, Gladwin. 300. Tap's Sports Bar: 8 Ionia Ave SW, Grand Rapids. Est. 1997. 301. Plainwell Lanes: 575 N. 10th Street, Plainwell. Est. 1947. Closed after 64 years. 302. Whitey's Way Inn Sports Bar: 12598 N. Saginaw Road, Clio. Est. 1992. 303. Legends Sports Pub: 121 South Grove Street, Delton. Est. 2006. 304. Mr G's Bar & Grill: 28937 Warren Road, Garden City. Est. 2008. 305. Charlie's Pub & Grill: 1052 Cooper Street, Jackson. Est. 2001. Previously 1052 Bar, est. 1985. 306. Theo's Bar & Grille: 407 E. Cross Street, Ypsilanti. Est. 1974, closed after 37 years. 308. Nottke's Battle Creek, MI. owner Dan LaBrecque said Michigan’s smoking ban contributed to the shutdown. Nottke’s had been in business for 52 years. Thank you to R. Ricard and Steve Mace of MI. for the information about the damages to Michigan's economy due to the Nicoderm (RWJF) funded smoking ban lobbyists. Clearing the Air will update this MI. list as well as the list of MN. establishments closed since smoking bans were enacted. Just remember the lies repeated to lawmakers by the aforementioned smoking ban liars (er, I mean lobbyists)......"smoking bans are good for business." Why would smoking ban lobbyists care how smokers kick their habit? Because the smoking ban lobbyists American Lung Assn., American Cancer Society, American Non-Smoker's Rights, Campaign for Tobacco-Free Kids, etc. are funded $446+ million by a foundation, (RWJF), with strong ties to Johnson & Johnson Company which manufactures and/or owns Nicoderm, Nicorette, Nicotrol, Commit, etc. 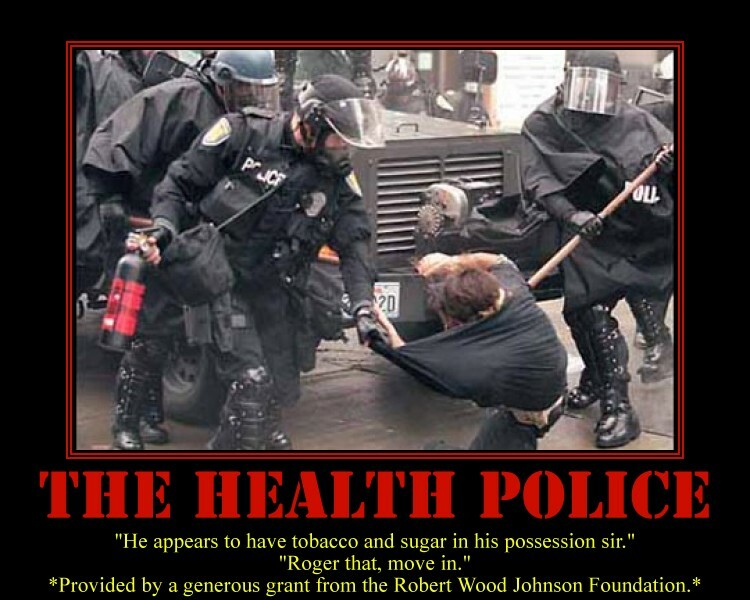 Most, if not all of the lobbyists aforementioned would not have had the money or desire to lobby for smoking bans if not funded and instructed by their puppeteers at the Robert Wood Johnson Foundation (RWJF). Meanwhile, researchers from the School of Public Health at the University of Sydney, Australia report the most successful method used by ex-smokers is unassisted cessation (cold turkey), not by using Nicoderm, Nicotrol, Nicorette, Commit, etc. Efforts by anti-smoking campaigners to reinstate a ban in small cafes and bars failed on Wednesday when judges in The Hague ruled the law does allow exceptions. Smoke-free laws do not discourage business activity. Independent, scientific economic research consistently proves that smoke-free policies have no net negative impact on the hospitality industry. Even as Clearing the Air has repeatedly informed ClearWay MN and other smoking ban lobbyists about the obvious massive number of 500+ local hospitality closings since smoking bans were enacted, right here in the Twin Cities area.